Cass Centre for Charity Effectiveness graduates take their learnings to the world. As graduates of the Cass Charity Master’s programme take the stage and receive their degrees, they do so knowing they have acquired the power to make change. 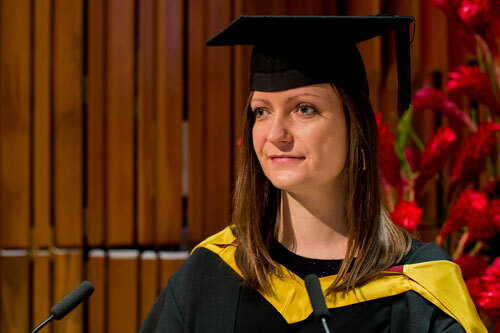 Anna Cogger, who addressed the Barbican Centre’s packed auditorium, said she was proud to be graduating alongside a cohort of students who are as passionate about the charity sector as she is. “Every student has brought their own experiences, from large or small organisations, international and domestic charities, and a wide range of roles,” she said. “And it is by bringing together all that expertise and experience that we will go on to be stronger leaders in the future. Other graduates have also taken the chance to provide their thoughts on the Cass Charity Master’s experience. Ms Cogger closed her address by thanking faculty staff for leading the course with passion, and by reiterating her pride in being part of such a prestigious cohort of graduates. “Studying this master’s gave me the conviction to take a step up; a leap of faith into a world of social impact bonds and outcomes contracts at a dynamic start up – something I would never have done otherwise,” she said. “I can say with confidence that I wouldn’t be doing a job I love, if I hadn’t studied this degree. “I’ll finish by saying a huge well done to every student graduating today. I hope you are as proud of each other as I am of you — I can’t wait to see what you all go on to achieve.